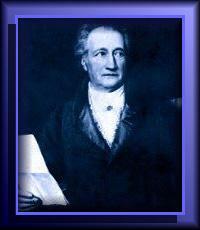 Born in Frankfurt A.M., August 28, 1749. Poet, dramatist, scientist, traveler, state minister, etc., author of Faust, Wilhelm Meisler, and many other works. Died in Weimar, March 22, 1832. In August 1781 the Grand Duchess Amalia of Saxe-Weimar founded the Tiefurter Journal, the Journal of Tiefurt, to which Goethe contributed at her invitation. When Rudolf Steiner was active as editor of the natural scientific writings of Goethe at the Goethe-Schiller Archives in Weimar, he published proof that the Fragment uber die Natur, The Fragment concerning Nature, which had appeared in the Journal of Tiefurt was definitely to be attributed to Goethe (Schriften der Goethe-Gesellschaft, Publications of the Goethe Society, ed. by Bernhard Suphan, Weimar, Vol. VII, 1892, article by Rudolf Steiner). Thus, just 110 years after the Fragment had appeared, Rudolf Steiner showed its importance and its relationship to Goethe's work. In the edition of Goethe's works published by Prof. Joseph Kurschner (1853-1902) (the volumes of Goethe's natural scientific writings edited by Rudolf Steiner), the Fragment appears at the beginning of the essays "On Natural Science in General," Vol. XXXIV, p. 1. The Fragment appeared in an English translation with notes by George Adams under the title, Nature-An Essay in Aphorisms, Anthroposophical Quarterly, London, Vol. VII, No. 1, Easter, 1932, pp. 2-5. In his Goethe's Conception of the World, Rudolf Steiner describes this Fragment as "the essay in which the seeds of the later Goethean world-conception are already to be found. What is here expressed as dim feeling, later developed into clear, definite thought." In similar vein, George Witkowski in his well-known biography of Goethe (Leipzig, 1899) describes this Fragment as "the seed from which came all of Goethe's great thoughts about nature."